Whilst doing comparisons of Ach, ich fühl's, I stumbled upon the marvel that was Maria Stader. The class of concert sopranos of the highest rank, long to be considered a vanished race, has found a worthy representative in the Hungarian-born Swiss soprano, Maria Stader, a favourite soloist of many of the worlds greatest conductors. This is not to say that the world of opera was outside the range of her art. Recordings preserve a long series of her beautiful interpretations of Bach and Mozart to Gluck and Puccini. These recordings, numbering over sixty works, have made her well-known to even the most remote areas of the world, illuminating most clearly all the virtues of her uniquely pure and flexible voice, with its bright radiance, beauty and warmth which make it ideal for oratorios and Lieder recitals, commanding the lyrical sphere as surely as that of a coloratura. 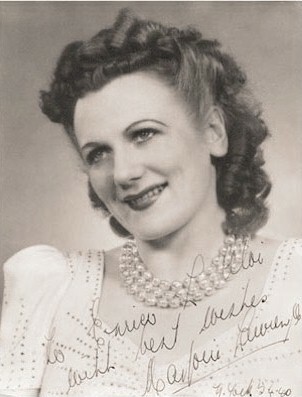 During the 1960s she also built up a splendid reputation as a Lieder singer. 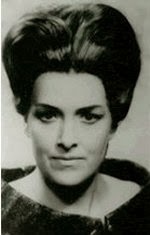 Maria Stader studied voice with Keller in Karlsruhe, Durigo in Zürich, Lombardi in Milan, and T. Schnabel in New York. She came to the notice of the public by winning first Prize as I. Concourse international dexecution musicale the Genève in 1939. 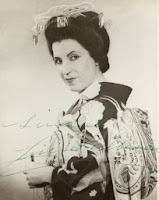 After a brief career as an opera singer, Maria Stader devoted herself to a distinguished concert career after World War II. She appeared in practically every major musical festival throughout the world. She first came to the attention of the American music public when she was invited by Pablo Casals to appear at the Prades Festivals. In the USA she appeared repeatedly with all the major orchestras as well as on television. Her appearances included the Philadelphia Orchestra in Philadelphia and New York, the Chicago Symphony, as well as Master Classes and recitals at the Aspen Music Festival. Maria Stader also completed a very successful tours through South America and the Far East. This impeccably stylistic interpreter of Mozart, in both operatic and concert settings, was awarded the Lilly Lehmann Medal, the Silver Mozart Medal from the city of Salzburg, the Austrian Order of Merit for Arts and Sciences as well as the Hans Georg Neagell Gold Medal from the city of Zürich. Maria Stader published her autobiography Nehmt meinen Dank (Take my thanks) in 1979. 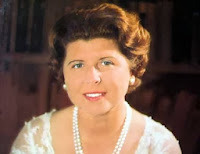 She gave her final concert in 1969 at Zürich, at which one of her accompanists was the famous Hungarian pianist Geza Anda. Stader also taught voice in Zürich and published a text book on Bach arias that was translated into English in 1968. I've often protested I'm a bel canto bear in a verismo world, and I will say that I didn't come to the November 16 performance of Die Frau ohne Schatten, by Herr R. Strauss, knowing what I was getting into. Not knowing the opera beforehand, I can say two things with great conviction: it's long and it's loud. And I can also say without qualification that I heard some glorious singing. Normally at this point I would provide a brief plot summary. "Ghostly ship's captain comes ashore once every seven years searching for true love, and one gathers that it never ends well." or "Nerd boy falls for popular girl, who only realizes she cares for him when he feigns indifference. Junior high school never really ends." (Both of these are actual quotes from my own reviews--Dutchman and Elixir.) Die Frau ohne Schatten defies such pithy brevity, but I'll try: "Goddess/Empress needs a baby in three days, but can't have one. Her evil sidekick recommends bribing a mortal to give the Empress her own shadow (fertility), but in the end everyone comes to their senses and all ends well. Except for the evil sidekick." There is much missing in that summation. It's very difficult to discuss this opera without getting into the symbolism! No surprise, then, that Andrew Porter's article in the program says, "That Hofmannsthal [genius librettist of Frau, as well as Der Rosenkavalier and Ariadne auf Naxos] intended Die Frau ohne Schatten to be the great German opera of the 20th century--encompassing heroic decisions in extreme plights, larger than life characters and common people, actions both naturalistic and enchanted--is clear. He would draw on all the resources of the lyric theatre through the ages, and do so with aristocratic deftness and grace." 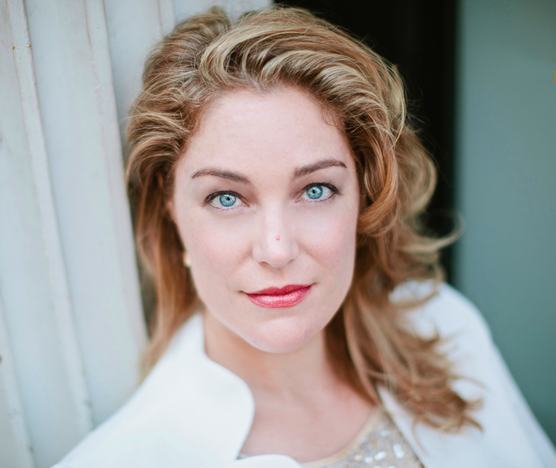 American Christine Goerke is no stranger to Metropolitan Opera audiences, having made her debut in 1995. As the Dyer's Wife (who has no name of her own), she also sang beautifully, with a huge and impassioned sound that was subtle where needed. In personality her Dyer's Wife was the equal of the bold Nurse (the Empress's evil sidekick), and even from the Family Circle, we could see her torment as she realized her current situation was far better than she'd thought, and far better than she might have gotten were she to actually trade her shadow for worldly goods. Johan Reuter, as Barak the Dyer, was a marvel. Glorious sound and a wonderfully strong but sensitive portrayal of Barak, visible even from the Family Circle. His list of accomplishments ranges from Guglielmo to Wotan to Nick Shadow at some of Europe's great houses, and this is no surprise. I won't stoop so low as to call him a Great Dane (particularly considering my unfortunate culinary experience recently at a pub of that name in Madison), but he's been around. He's been on the roster at the Met since 2012. This 2001 Metropolitan Opera production is by Herbert Wernicke, and is visually stunning. Mr. Tommasini of The New York Times wrote, "The bold, inventive production, for which Wernicke also designed the sets, costumes and lighting, is one of the great achievements of Joseph Volpe’s tenure as the Met’s general manager, and it is good to have it back." All I can say is I was glad to have it as my introduction to this amazing opera. Rather than desperate to return to the order and delicacy or Donizetti and Bellini, I left wishing I knew this score better. I have been quite outspoken in the past about my opinions of Sondra Radvanovsky. I've said I thought she wasn't on the same technical level as some of her colleagues, and I thought she lacked polish and subtlety. 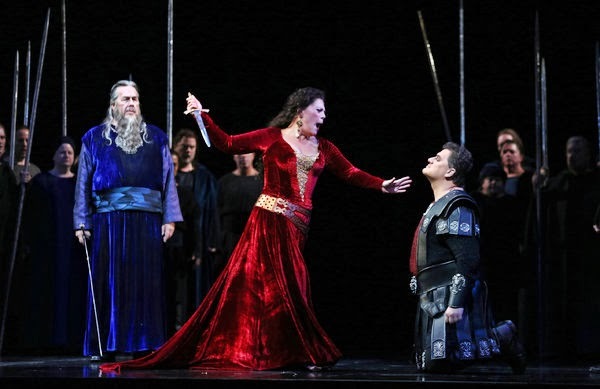 Based on what I heard at the Met's final Norma performance of the season on November 1, I really must reconsider that opinion. While I stand by those opinions at those times, now I am forced to admit things have changed considerably. 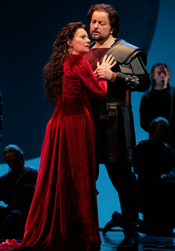 Sondra Radvanovsky's Norma was a marvel. She has learned to use her huge, dark, luscious voice in ways that are surprisingly agile and free. None of the strain or unnecessary vocal choices I've heard before in the upper middle voice were there, and in fact, her voice was more even and free than I have ever heard it. The middle still has some "veil" to it and some metal--both appropriate to a huge voice. I heard her use a wide dynamic range, and in fact many times she brought back the sound to a piano that was thrilling. And what beauty in her high voice! Casta diva was a lesson in legato singing and control, and Ah bello, a me ritorna, the following cabaletta, was clear and passionate. Her coloratura singing, while not the 70 mile-per-hour singing we've heard from some divas, was clear and fast enough. Most importantly, we knew why all those flashy vocal passages were there--to convey heightened emotion, not merely to show off. I look forward to seeing how all the vocal work affects Ms. Radvanovsky's Verdi. The opinions that several friends shared with me held true--Ms. Radvanovsky was the best thing in a pretty pedestrian production of Norma. While in the past I've written that she did not seem at the same level as the rest of the cast, this time I must say the rest of the cast were not at her level. Alksandrs Antenenko, Pollione, was certainly passionate and dashing, and had some lovely sounds, but overall his voice seemed uneven. I almost want to refer to his voices, plural. Kate Aldrich seemed to have bitten off more than she could chew with Adalgisa. Looking at the lyric roles she has performed, as listed in her program bio, one wonders why she was cast in a role historically associated with Fiorenza Cossotto, Giulietta Simionato, and Dolora Zajick. Her singing sounded over-produced to me, and she was hard to hear at times. And James Morris as Oroveso. 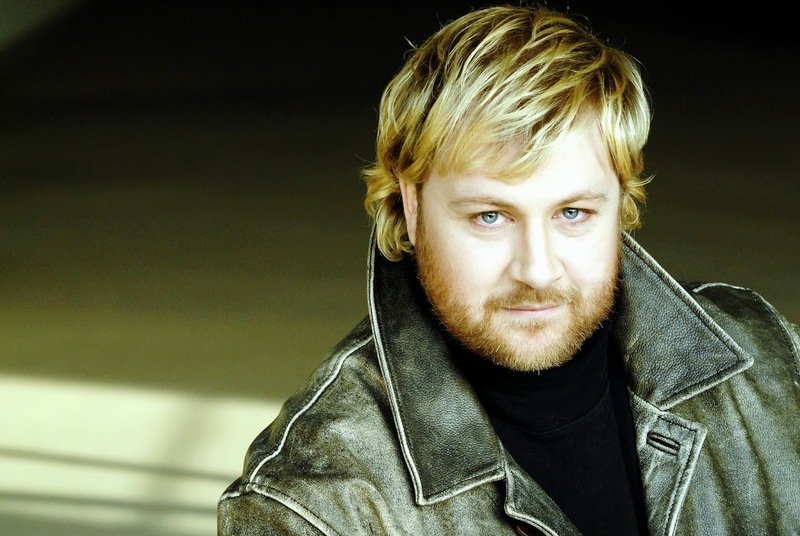 I raved about his Claggart in Billy Budd, but his vocal quality does not fit Oroveso. The Metropolitan Opera Chorus was excellent, as always, but dear Lord, they needed better direction than they got! Everyone needed better direction than they got from Stephen Pickover (in John Copley's 2001 production). It pains me as a Norma-phile to say this, but Sondra Radvanovsky was truly the best thing in this show, and some might say the only reason it was worth seeing. That's something I never thought you'd read in these pages. I regret that I have never featured Licia Albanese in these pages. She is just the sort of singer this blog was created to feature. Her career at the Met spanned the years from 1940 to 1966, singing 427 performances of 17 roles. She began the Licia Albanese-Puccini Foundation in 1974 to pass on the legacy of Italian opera to the next generations of opera singers through master classes, grants and scholarships. Quite a few of the singers in the world's great opera houses have benefited from the support of the Foundation. Ms. Albanese is still very much alive at the age of 100. On Sunday, October 27, I was privileged to hear this year's crop of award winners in concert, and I must say I heard some very fine singing indeed. There were fourteen grant winners this year, most of whom performed on the concert in the first half. It's impossible to name them all, but to me standouts among the grant winners included tenor Aaron Blake and baritone Ricardo Rivera, who performed the Act IV Rodolfo-Marcello duet from La Boheme; baritone Jamez McCorkle, who sang Ya vas lyublyu from Pique Dame; and soprano Courtney Mills, who sang a passionate and beautiful Ritorna vincitor. The second half of the concert began with Distinguished Achievement Awards given to winners from previous years who have gained great success. These included Kristin Chavez, Jennifer Check, Jill Grove, Eglise Gutierrez, Carl Tanner, and Ricardo Tamura. With the exception of Mr. Tanner, who was ill, all of these alumni performed arias, to well deserved and enthusiastic applause. Ms. Chavez gave us a memorably lusty and earthy performance of the Habañera from Carmen. Ms. Check performed a vengeful Vieni t'affretta from Macbeth and Ms. Gutierrez sang a lovely O mio babbino caro. Pianists Arlene Shrut and Jonathan Kelly provided accompaniment for the distinguished alumni. The remainder of the concert featured prize winners. My favorites in this group included Second Prize winner Anthony Kalil, who sang an impassioned E lucevan le stelle from Tosca. A big, beautiful sound from a handsome fellow who has already seen the beginnings of a successful career. I also quite liked First Prize winner Takaoki Onishi, who sang Per me giunto from Don Carlos. And it should surprise no one to read that my favorite singer of all was soprano Jennifer Rowley. She sang a perfectly lovely Come in quest'ora bruna from Simon Boccanegra, her warm soprano gleaming with the dream-like quality of the aria. Eve Queler, herself a legendary figure in New York's opera world, led an orchestra comprised of members of the Opera Orchestra of New York. A legend driving the proceedings, a legend at the podium, and surely many legends in the making on the program. A pretty darn good way to spend a Sunday afternoon. This was the Royal Opera's main contribution to this year's Verdi celebrations, although I confess I booked at the last minute owing to a cast change. Notwithstanding, there had been much excitement in the run up to the premiere. Not only was this the first—yes, first!—production of the piece at Covent Garden, but also the London debut of Norwegian-born directorial Wunderkind Stefan Herheim, whose productions have been feted around Europe for some years now, as recently as Die Meistersinger in Salzburg this summer. Michael Volle (Guy de Montfort) and Bryan Hymel (Henri) in Les Vepres Siciliennes. Vêpres is a strange Verdi opera. Firstly, it is structured as all commissions of the time for the Paris Opéra, in five acts with a ballet in the third, and a libretto in French (by Eugene Scribe). Huge plaudits to the Royal Opera for performing in that language, for the piece's unique sound world relies on the language to shape the lines quite differently from his Italian works. At times one could be listening to Meyerbeer, or Gounod (especially the large set-pieces); elsewhere, and perhaps especially in Act 4—a series of virtuoso arias, duets and a glorious quartet to cap it all—it is unmistakably Verdi. But it can feel a clumsy, incoherent work, even when the half-hour ballet of the seasons is missed out, as here, rendering the middle act strangely short. I suspect more readers will be familiar with the Italian version (I Vespri Siciliani) but as with Don Carlo/Don Carlos, the French libretto truly unlocks the treasures which may otherwise lie hidden. I was expecting to be surprised, perhaps shocked or indeed perplexed, by Herheim's production. I was certainly shocked although mainly by his breathtaking stagecraft and surprisingly coherent dramatic rendition of the piece. Taking the reasonable view that a period setting of 12th Century Sicily would not speak loudly to a London audience of today, he and his team—Philippe Fürhofer (sets), Gesine Völlm (costumes), Anders Poll (lighting), André de Jong (choreography) and perhaps most importantly of all Alexander Meier-Dörzenbach (dramaturge)—have devised a different scenario altogether. We find ourselves at the Paris Opéra around the time of the work's premiere. 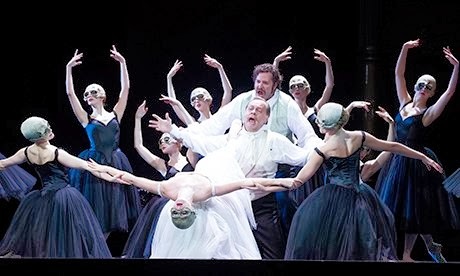 Broadly, the Sicilians are represented by the 'artists', most of all the female corps de ballet often seen rehearsing at the barre, with the occupying French as the audience or aristocracy. The battlefield, then, is art—its ownership or patronage—rather than a war torn Sicily of yesteryear. Erwin Schrott (Procida), Lianna Haroutounian (Hélène), Bryan Bymel (Henri). The piece describes a semi-historical occupation of Sicily in the 12th Century; Montfort is the tyrannical governor, who raped a Sicilian woman and fathered Henri, a Sicilian freedom fighter, himself in love with Hélène, a noblewoman whose brother was executed by the French a year before the opera begins. The last key figure in Procida, Sicilian commander exiled after a wounding by Montfort's forces in the period before the start of the action. 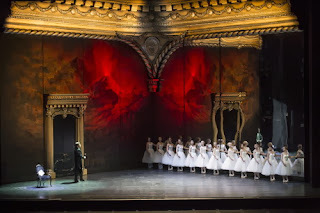 There is no shortage of detail in Herheim's direction, and he establishes his scenario and visual language during the (splendid) overture, where Montfort graphically rapes a 'Sicilian' dancer after the maiming of 'Impesario' Procida in the ballet rehearsal room. Henri is the child of that encounter and his pregnant mother and childhood self appear throughout the rest of the production in various guises. Fürhofer's virtuoso designs are breathtaking, moving seamlessly between the stage, rehearsal room and auditorium of the opera house, often extending the horseshoe of Covent Garden's own auditorium deep into the stage. A mural depicting a pastoral Sicily with a furious Mount Etna appears at various points, and 'Royal' observers appear in the stage boxes watching the 'action', or taking part in it in the arena below. Herheim's command of the stage space is masterful, the huge ensembles are formed with a rock steady directorial hand, and De Jong's balletic choreography is seamlessly integrated into the action with a skill I have seldom seen before. Herheim describes his approach as stemming from the music first, the words second; his direction here is very responsive to the musical colours in the score. Inevitably there are details that jar. The constant abuse of Hélène's brother's death mask is one example, and I can't entirely fathom why Procida appeared in drag to begin the slaughter at the end of Act 5, gamely as Erwin Schrott frocked up. Act 4, where Verdi produces his finest music, is the production's weak point, the principals seemingly left to their own devices and often resorting to stock gestures. It's hard to know why this is, as the 'stage' setting may have led Herheim to encourage 'stagey' body language. An alternative explanation may be a lack of rehearsal time and some last minute cast changes (see below). The finale is a bit of a mess, the bright lights shining out into the auditorium amid general disarray onstage a bit of an anticlimax. It may, though, be beyond the wit of man to make credible drama of the material Verdi provides here. Quibbles aside, the staging provides a veritable Smorgasbord (sorry—Herheim is Norwegian) of food for thought, as well as much genuinely stunning stagecraft. Most of all his team confers coherence to a sprawling piece which badly needs it. Worth seeing, possibly seeing again, I think, and a significant house debut. For such a vast work it is perhaps surprising that there are really only four principal roles. None of the comprimario parts stands out although they were adequately sung in this production. The sung French is ranges from poor to adequate with much variation. Above all, it is an evening for the men, as low voices predominate. The standout performance for me was Michael Volle as Guy de Montfort, both tyrannical baddie and wannabe father to Henri. Volle commands the stage from the outset, and brings generous tone and a striking command of Verdian style. Looking at his roster of roles—Wagner, Strauss, Verdi, Puccini—fills me with admiration for what a versatile singer and actor he is, fully justifying what may have felt like a casting gamble. The other low male voice is the Procida of Erwin Schrott. A big hit with the house, he too has plenty of tone but to my mind sings too frequently out of tune. His preening, grandstanding stage presence may well be Herheim's doing, although I still feel he could have made more vocally of his big aria at the start of Act 2. 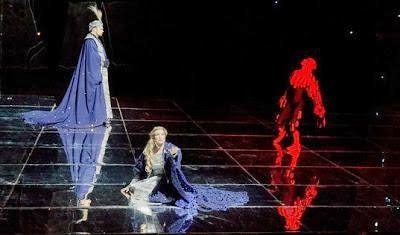 Verdi and Scribe don't do many favours to the lovers Henri and Hélène; once Henri discovers he is the son of Montfort, his impossible situation can't really be resolved, leaving him dramatically high and dry from Act 3 onwards. Furthermore, it's an excruciatingly difficult sing, frequently venturing higher than most Verdi tenor roles but requiring a robust dramatic sound. 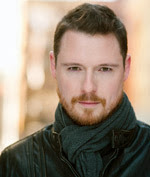 Covent Garden did well to cast Bryan Hymel, who added this bravura performance to his growing list of successes in London and elsewhere. Utterly secure and often thrilling, he was terrific. Pedants will note that he ducked his high D in Act 5 but only the truly misanthropic would hold it against him. We already know that Sir Antonio Pappano knows how to conduct Verdi, and his performance here justified the company's revival of the piece. Most exciting of all were the set pieces, the chorus (significantly augmented) on cracking form. I don't share the unmodified rapture of some critics, as some tempi seemed too swift (especially the Act 4 quartet—but he kept the unwieldy juggernaut on the road and kept what dramatic tension Verdi allows to be created at the forefront. The verdict: viva Verdi, in your anniversary year; your Vêpres are not a masterpiece, but they have made it to London in grand style. And for that, molto grazie. I was delighted at the opportunity to hear New York Symphonic Arts Ensemble's October 19 presentation of the Verdi Requiem. NYSAE is an orchestra of skilled amateurs celebrating its 25th season of performing. The ensemble's music director, Timothy Hutto, is a good musician and a friend. The group was joined by the Arcadian Chorale, the Richmond Choral Society, and the New York Festival Singers, with guest conductor Marina Alexander. The performance took place at the Church of St. Paul the Apostle, near Lincoln Center. As usual, I will begin with the rave-worthy elements of this concert. And boy howdy, mezzo Sara Murphy is worthy of my most enthusiastic raves. Her Lux aeterna was lyrical and full of drama at the same time. Her Liber scriptus has set a new standard by which I shall judge all other performances of Liber scriptus. Her performance was sensitive musically and completely on the mark vocally, her sound always beautiful and free. Why is this lovely woman not singing everywhere? I would compare her to Amnerises and Adalgisas with world-class careers today, and she'd win. Another praise-worthy element of this Verdi Requiem was tenor Enrique Pina. (I want so badly to put make it Piña, but it is indeed Pina.) I was impressed by his vocally secure and self-assured performance in this concert. (Here is a YouTube link to hear him singing Ingemisco from a concert in his native Dominican Republic in 2012.) Given the fact this is not his first Verdi Requiem, however, one does wonder why Mr. Pina was so closely invested in his score for every movement in which he was involved, including Ingemisco. But for the most part, however, his singing was quite good. The bass soloist, Gustavo Ahualli, has been mentioned here before, in a post about another Verdi Requiem performance. I said then that although his singing is beautiful--and it truly is--the role simply requires more of a bass than a bass-baritone or baritone. I still stand by that statement. The orchestra and chorus simply were not ready. Under-rehearsed is the kindest way to describe the situation. I won't list examples of unfortunate incidents--Mr. Hutto and Ms. Alexander surely have their own lists. The venue was a very poor choice. Acoustics were bathtubby, to say the least, leading to a very soupy sound and tremendous lack of clarity in different voice and instrumental parts. The layout of the church created a balance problem and a timing lag between chorus and orchestra that was unacceptable. The soprano soloist was not up to the job, simply not at the same level as the other soloists. Remember, the Verdi Requiem is built around the soprano soloist. While she did have many beautiful moments--most notably singing piano in a comfortable range--there were times when the vocal demands seemed beyond her capabilities. Further, although I begrudge no one a music stand in place of holding the score--and I don't know the reasons she had a music stand--her unladen arms flailed about in quite a self-indulgent way, telegraphing not only the degree of difficulty of any upcoming passage, but also the mere fact she was about to make a vocal entrance. For all that histrionic energy, she didn't always seem very involved in the music she was singing, beyond its vocal difficulties. October, 2013, marks the 200th anniversary of Mr. Verdi's birth. NYSAE's intention was to honor Verdi and his music on its own 25th anniversary. To do honor to Mr. Verdi on his 200th birthday, perhaps it would have been better to revise the plans. 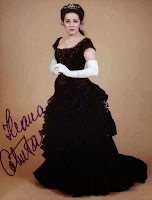 Today we discuss an underrated soprano of the 70s and 80s, Ileana Cotrubas. (Here is another bio link.) She was renowned for her expressive singing and acting. 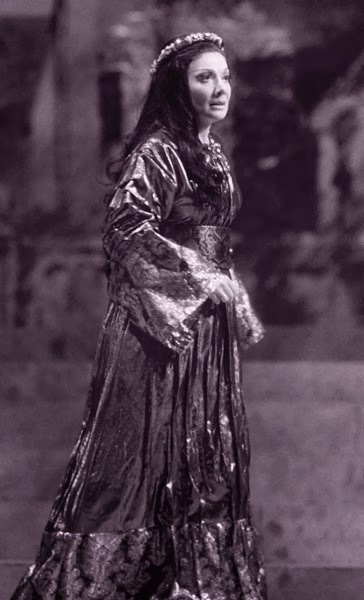 Many might know her only from Metropolitan Opera or Covent Garden telecasts/recordings from the late 70s and early 80s, but there is a wealth of other recordings that are even more beautiful. To my ears she was best suited to the dramatic coloratura and light lyric rep. I have sat behind many an audition table, both as administrator of a small opera company, and as advisor to other organizations. (Note to other organizations: My ears and evaluations can be had on the cheap!) It is quite common for me to think, "Gee, I'd like to hear that voice after another year or two of polishing!" That is a good thing. And that was my overwhelming feeling as I watched Delaware Valley Opera's performance Monday, October 14, of staged La Traviata excerpts. (The same cast will perform a much fuller version of the score, fully staged and complete with orchestra and chorus, in Rhinebeck, NY, on Sunday, October 20.) Monday night's staging alternated between OK and awkward, for aside from Alfredo, Violetta, and Germont, we only had Grenville and Flora/Annina. Party scenes? Not so easy. Young and beautiful Julie-Anne Hamula was Violetta. Both Violetta and Ms. Hamula were the star of the show. Her bio-blurb lists lists Adina, Gilda and Lauretta, which seem to me to be quite appropriate roles for her. She's also sung heavier roles. I think Violetta is a little on the heavy, mature side for her fresh, young voice. That said, there was great beauty and passion in all of the role for Ms. Hamula. Her most beautiful moments vocally were when she sang piano and/or legato. There was vocal and dramatic magic in "Dite alla giovine....", from her scene with the elder Germont. It pains me to say this, but Act I, containing Violetta's best known excerpts, was Ms. Hamula's weakest act. While she seemed comfortable acting against either Germont, especially the elder, left alone on the stage she seemed uncomfortable. And her vocalism was at its best in Acts II and III. Dashing young John Kaneklides gave us a pretty darn good baby Alfredo. His is a voice that will grow more fully into roles like Alfredo, and I look forward to hearing him in one or five or ten years. His bio lists roles like Tamino, Nemorino, Fenton, and Rinuccio. These I can easily hear in his voice, with its very warm but still light quality. He did a good job with Alfredo in Monday's performance, including the cabaletta to Dei miei bollenti spiriti and its punishing high C.
Wayne Line is the most experienced of the three principals, and one heard it in his Germont. Young Meredith Hudak and Georgios Papadimitriou gave us as much of Flora, Annina, and Dr. Grenvil as was practical in this highlights performance. DVO General Director Carol Castel brought out the characters well, particularly with Ms. Hamula's Violetta. I regret I will not be able to see the fully-staged performance on Sunday in Rhinebeck. 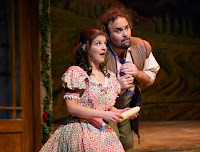 Two weeks ago I had the pleasure of seeing Baltimore Concert Opera's performance of L'Elisir d'Amore. I wrote about it here. On Friday, October 11, I had even more pleasure in seeing the same cast perform a fully staged version at Opera Delaware. And I don't know where to begin. While it is impossible to avoid comparisons between the two performances, I do not want in any way to dilute the high praise I paid the Baltimore Concert Opera. But holy cow, what a sweet show this was! This Elixir was full of delightful directorial detail that continually had me giggling or murmuring, "Awwwwww!" (I don't giggle lightly, and although I murmur far too often, rarely is it, "Awwwwww!") 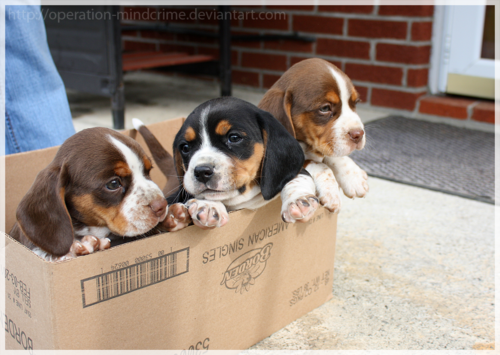 I tried to tell my DH that this show was cuter than a box of puppies. He didn't believe me, but he wasn't there. I hope you'll be there Sunday for the second and final performance. I wrote two weeks ago that it seemed the cast felt limited by the constraints of a concert performance, as they had been in staging rehearsals for a week already. No such issue now! All of the cast threw themselves into their roles with a wanton abandon that is delightful to see. And all of the cast sang even more beautifully when given the freedom to inhabit their roles fully. In particular I must say William Davenport really redeemed himself. 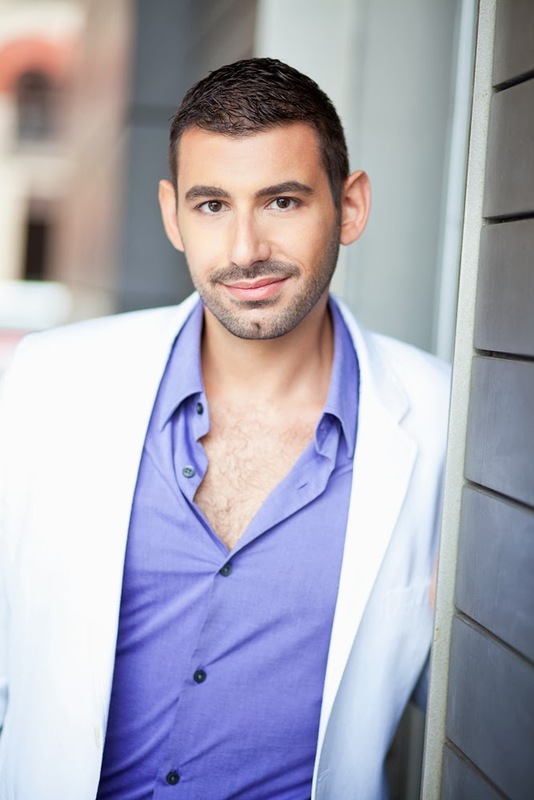 Two weeks ago I questioned casting him as Nemorino, for he has a fuller, larger voice than I prefer as Nemorino. Although he sang it well, I thought his voice was too big for the role. Now I must correct myself and say it was likely just too big for the room. At the Engineers' Club in Baltimore, it seemed like he was holding back the vocal sound. No such feeling in the Grand Opera House in Wilmington. He sang with his own voice, comfortably filling the hall with sound, and oddly enough, in doing so he sang at times with a lighter, more supple sound. His Nemorino was all country bumpkin--a true innocent who wears his heart on his sleeve. Sharin Apostolou's acting talent, about which I have written before, was clearly evident in this production. We know her Adina isn't the cold-hearted teenage girl about which popular movies and TV shows are made (think Shannon Dougherty, back in the day), but rather a quite human mix of innocently self absorbed and truly caring (Jennifer Love Hewitt?). As with Mr. Davenport, throwing herself into the role made her singing even more beautiful than before. I do wish the orchestra, under the capable baton of Jerome Shannon, hadn't overpowered her so often. All the praise I gave Trevor Scheunemann two weeks ago in Baltimore held true in Delaware. His singing was glorious, and he acted the ridiculously vain Belcore with a great joy and passion that was a pleasure to see. As I wrote before, to Belcore love and war are both games, and not only does he not take his own braggadocio seriously, he doesn't really expect anyone else to believe it, either. The only thing I'd have added was more of an "Oh, @#$%!" moment when Adina consents to marry him that very day, but that is directorial icing on the cake. The cherry on an already delicious sundae. 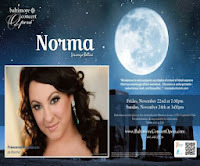 Once again Stephen Eisenhard proved a capable Dulcamara and Kimberly Christie a charming Gianetta. The chorus, under the direction of Jeffrey Miller, sounded wonderful while also acting as country peasants with great spirit. Jerome Shannon and the unnamed orchestra played well, but there were points where they overpowered the singers, as I mentioned above, and a few points where the pit and the stage were not in perfect synch. (Given the very high cost of having an orchestra at all, a small opera company can be forgiven for small points like this. I also wonder whether the balance issues I mention held true in all parts of the house.) Costume, wig/makeup, and lighting were all charming. Finally, I must now rave about the Grand Opera House in Wilmington, Delaware. This beautiful old performing space was opened in 1871 as a Grand Lodge for the Masons (the edifice features Masonic images). The Grand has played host to thousands of renowned entertainers and performing artists over the years, including Ethel Barrymore, Buffalo Bill Cody, and John Philip Sousa, but it had evolved into a vaudeville house and movie theater by the mid 20th century. Lovingly restored in the early 1970s, the Grand is now the venue for Opera Delaware productions and a wide range of other performances. I noticed in the lobby large posters for upcoming shows with Bonnie Raitt and Wanda Sykes. Some readers will recall a post about a lovely performance of Mr. Rossini's Petite Messe Solennelle a few years ago. The tenor soloist in that performance was Michele Angelini. 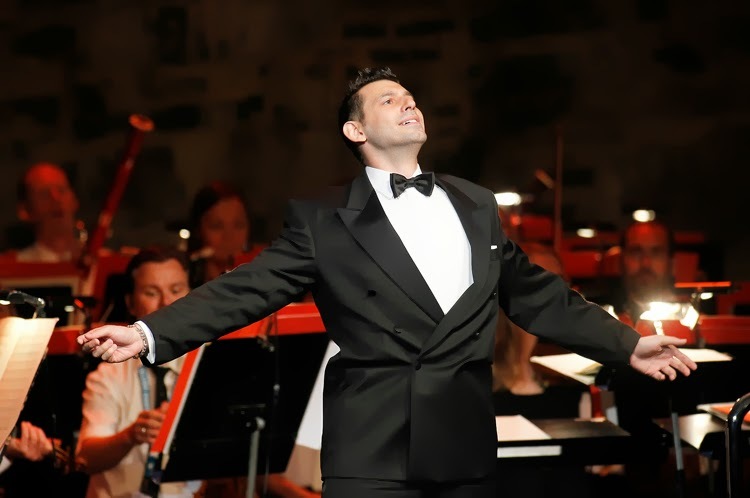 His recently revamped web site lists an impressive range of credits, including covering Juan-Diego Florez and Lawrence Brownlee at the Metropolitan Opera, an upcoming debut at Covent Garden, and performances at the Rossini Opera Festival, Deutsche Oper am Rhein (Frankfurt), Carnegie Hall, and the Kennedy Center. Mr. Angelini (Mike to his friends) has forgiven me for that blog post--my primary memory now is of a beautiful and free sound, but apparently at the time I thought he lacked subtlety--and has consented to a profile in these humble pages. We recently sat down for a lovely outdoor lunch and interview. We talked at length about his career, singing and fitness, and taking care of one's voice like the owner of a priceless instrument would do. What do you want to tell the world? What one message? Be true to yourself. Be true to your voice. Be true to the elements of this art form that drew you in. You must maintain that connection with what attracted you. Keep that magic. Have there been times when you've had to struggle to keep that alive? Challenges that you've had to overcome? Of course. There are no easy answers. When I first started out in this career, I had no idea what it took. We all get into something like this because it's fun, it gives us joy, we seem to be good at it. If we're getting paid, so much the better. The veneer comes off and we realize there's a lot of work, discipline, maintenance, and business sense required. I was fortunate at the beginning. I began working as a singer almost right out of college. I had a good group of people who cared about me and believed in me. They introduced me to opportunities, and I was able to effectively begin my career at age 23. I had to learn a lot on the job, where there was no room for error. It was hard to learn how to deal with all the things I was confronted with, without any buffer zone, where every move had to be the right action at the time. I'm fortunate that no mistakes I made were irrevocable, but I did have a very tough challenge early on. I was 25 at the time. There's a natural growth spurt that happens for many singers at 25 or 26. I'd just finished my first Ramiro (Cenerentola), and within a week the way I had naturally always sung, particularly my upper register, just stopped working. There were some things going on in my personal life, as well—very painful loss and worry--and it exacerbated the situation. My voice became volatile, inconsistent. There were great days and there were days when nothing was happening correctly. I made the mistake of singing in a competition, and of course I did not sing nearly as well as I could have. Because of that one performance, I was asked to re-audition for several upcoming contracts to prove I was still capable of singing the roles. It was difficult. I became a man with a mission. I wanted to sing for upcoming contracts at a professional level. I had six months before my next contract obligation, and I basically took all of that time to work on my voice. I didn't go out, I didn't socialize—I just saw my family, my teacher, and my coach. I worked on my voice and I worked on my body. That was also when fitness started becoming much more important to me. At the end of that period, I was able to walk into my next job without an worry. I was able to re-establish myself with individuals who had lost faith in me after that one disastrous performance. We all have to learn to sing when we're not at our best. When I was younger I was much more afraid of putting myself out there when I wasn't feeling as well, but as I've become more secure in my technique, I've learned to let my technique and my experience work for me. That's a big lesson—what variables can we control, and what is beyond our control? You told me recently that as you grow and mature vocally, you feel even more firmly placed in your fach, whereas other guys your age might be looking at or moving into more mature or bigger vocal categories. The issue of fach is a tricky discussion. The fach system has its benefits as a tool for categorizing the repertoire and voices, but on the other hand it's important to understand every voice is different, every person is different, every approach is different. Your voice will tell you what it should and should not be singing. It's important for every singer to learn to recognize that. At the end of the day the only person who can make those decisions is you. You must know what your voice is meant to do. And let's face it—there are voices that transcend fach. Nicolai Gedda could sing practically anything that was on the page, but he was always true to his own voice and never sacrificed what was natural in his own voice. Herbert von Karajan asked him to sing Bacchus (Ariadne auf Naxos) in his mid-20s, and he said no. But he sang Don Jose in his 20s. He knew what he was doing, how to negotiate just about any role using his own voice. We all have a little bit of trial and error, but it's best to not make too many errors. When I was young I used to sing along with all the recordings I had, a little bit of everything. Coming from an instrumental background (Mr. Angelini is a highly accomplished woodwind player, as well), I didn't know about fach. I had this idea that all music written for tenor could be sung by any tenor. As an instrumentalist there is no excuse to not play any piece of music. If it's written for your instrument you have to figure out how to do it. Not so with the voice. It's as if each type of tenor is a different instrument. But I have to say I love my repertoire. There is nothing in my core rep that doesn't make me happy, and that singing doesn't bring me some level of joy. 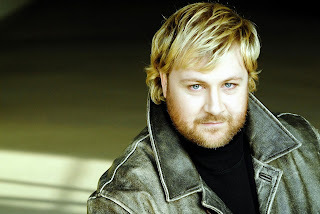 I can enjoy an excellent Siegfried without wanting to sing the role. I don't think, “I have to sing Rossini today but I want to sing something else.” I'm thankful that I get to sing the repertoire that I do sing. It's almost limitless. The bel canto, Baroque, Mozartian and early Romantic French opera that I consider my core repertoire is unending. It wouldn't be possible to sing everything that my voice could sing. I'm like a kid in a candy shop. And I get to cater all those roles to my voice. I can sing Rossini and add and subtract to show off what my voice does best. You can't do that with Puccini or Wagner. Now if only someone could write me a mad scene, I would be even happier. I talk about this with other singers who are very fit, like you are. It often seems like there is a concern that they want singers to look like Hollywood stars, and there is a fear that singing talent is considered secondary. It's true that directors are asking more of singers physically these days, so we do have to have a certainly level of fitness to do those things with comfort and ease. For me, the body that houses a voice doesn't matter if the voice is able to do what the role and the character requires. But I'm not a director and I'm not casting, so it's not really my place to say much more about this. Fitness has more to do with my instrument and my physical well being than something about looking a certain way for the stage. Singing really is a sport. It's an athletic endeavor. My body is my instruments. I treat my body like an athlete would. That means feeding my body properly, working on overall fitness and flexibility, working on breathing, and having a certain measure of athleticism. When I first started becoming more active and athletic, I noticed an improvement in the way my voice was responding and my breath was working. I found myself practicing silently on an elliptical machine, memorizing my roles, breathing as I would were I singing. It made a huge difference in terms of what I could do in the practice room and on stage. I think yoga is a huge essential as a singer. There was a time when I used 10-15 minutes of yoga as a warmup before singing anything. All the core muscles, all the parts that have to be in alignment and function properly for singing are already moving and released and ready to work. I didn't have to work so hard vocalizing because the muscles were already prepared to do what they would be asked to do. There is something phenomenal about having that sense of inner flexibility as well as the sense of breathing, relaxation, and getting rid of tension. Then we are able to do much more musically, dramatically, vocally. I think it all kind of goes hand in hand. You seem happy with your body. What if a director asked you to sing without clothes? Not right now. [laughs] I did sing in my underwear in Il sogno di Scipione with Gotham Chamber Opera. I don't think there are any pictures of me in my underwear. I always conclude with a question stolen from Inside the Actor's Studio--what's your favorite swear word? All of them? So many! So many different languages. My favorite is in Italian: cazzo. Literally it means male member, but it's the Italian equivalent of the F-word. 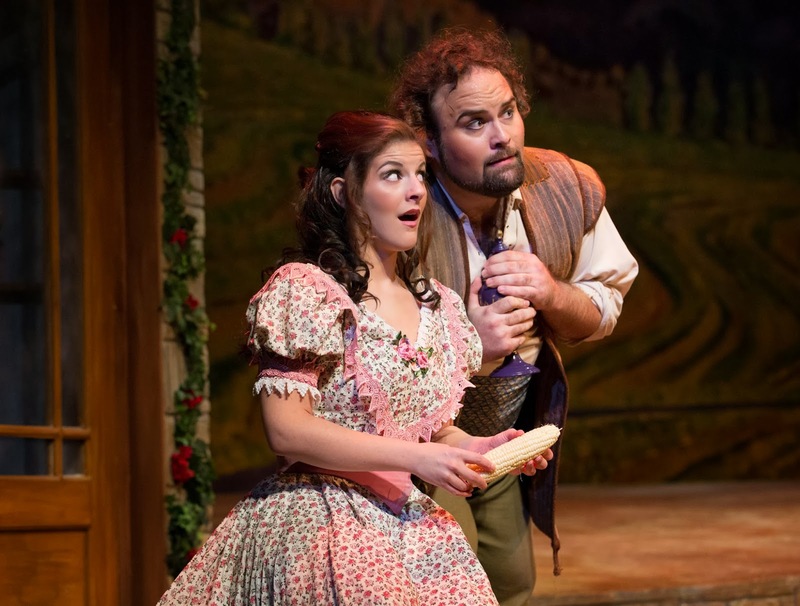 I had the delight of seeing Baltimore Concert Opera's semi-staged concert version of Mr. Donizetti's L'Elisir d'Amore on September 29. Baltimore Concert Opera is one of several opera groups that sought to fill the void left when the venerable Baltimore Opera Company folded in 2009. This article tells how Brendan Cooke, co-founder and Artistic Director of Baltimore Concert Opera, worked tirelessly to keep opera alive in Baltimore. When Mr. Cooke was named General Director of Opera Delaware in 2012, a relationship between Baltimore Concert Opera and Opera Delaware was initiated that now includes productions jointly planned and funded by the two companies. 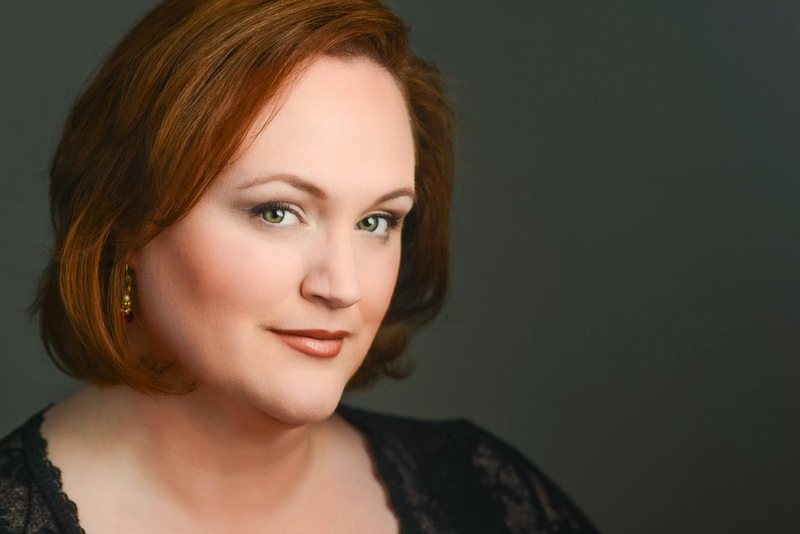 Local opera afficionados say the biggest difference this association has meant for Baltimore is a higher professional level of the singers engaged for principal roles. And a very fine cast it was indeed. Headed by the Adina of Sharin Apostolou, the cast also included William Davenport as Nemorino, Trevor Scheunemann as Belcore and Stephen Eisenhard as Dulcamara. Ms. Apostolou and Mr. Scheunemann were the two standouts in the cast. I've raved written before of Ms. Apostolou's gleaming soprano and involved, realistic acting, and I was not disappointed on Sunday. Prendi, per me sei libero is my absolute favorite passage in this opera, I must confess that a furtive tear did roll down my cheek as Ms. Apostolou sang it. Mr. Scheunemann's bio lists the Metropolitan Opera, San Francisco Opera, and Washington National Opera among his credits. This is not a surprise. His Belcore was a beautifully sung combination of swagger and fun. To my mind, a successful performance of Belcore shows the signor sargente has enough sense not to take his own braggadocio seriously--women and war, he sings, are both great games--and Mr. Scheunemann very often gave us such moments of clarity. 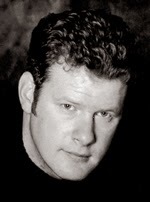 Tenor William Davenport gave us an ardent Nemorino. His bio-blurb lists Edgardo in Lucia di Lammermoor, Gustavo in Un ballo in maschera, and the Duke in Rigoletto. Those roles would fit Mr. Davenport's beautiful voice perfectly, but it pains me to say I think Nemorino doesn't. Nemorino requires a lighter voice, while Mr. Davenport's voice is quite stentorian. 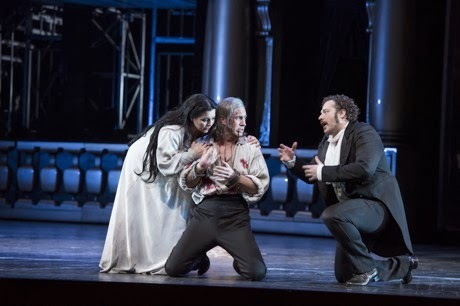 This is not a complaint about his singing, for he sang the role well, and received well-deserved (if annoyingly premature) shouts of "Bravo" at the conclusion of Una furtiva lagrima. Stephen Eisenhard has the goods as a basso buffo, handling Dulcamara's rapid-fire patter with ease and showing a comic flair. Kimberly Christie shows great promise in her debut role as Gianetta. It sometimes seemed as if the cast were eager to do more with their roles, but felt limited. 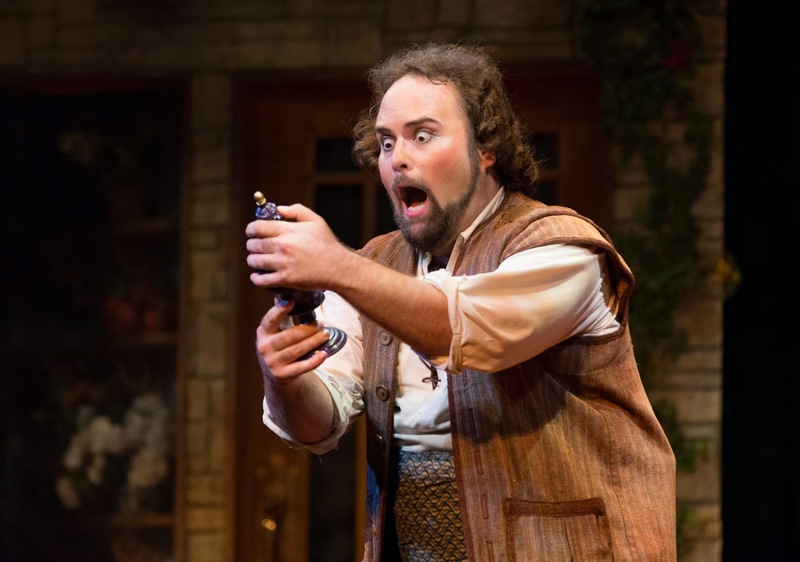 The same cast performs L'Elisir, fully staged, at Opera Delaware on October 11 and 13, and I was not surprised to learn they had been in staging rehearsals in Wilmington all week. Alternating between the Baltimore version and the Wilmington version--surely as a concert performance, Baltimore had cuts Wilmington doesn't--could explain the occasional ragged feel in terms of cues and continuity. Complaints? One or two. When the chorus sang, it was hard to distinguish the soloists' vocal lines, which is not surprising considering physical placement of the chorus. Occasionally the 88-key orchestra (overall very well done by James Harp--especially his commentary on the love potion of Queen Isolde) overpowered the singers, too. Along with difficult to read supertitles, these are mere quibbles. I call this a fine performance, and I look forward to seeing the staged production at Opera Delaware. I recommend you do the same. 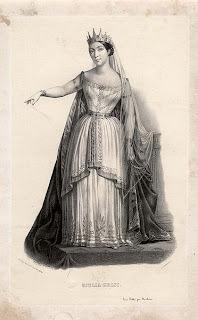 I wrote before of two notable mezzo-sopranos who were featured quite often beside Dame Joan Sutherland, Montserrat Caballé,and other great sopranos of the 60s and 70s--Huguette Tourangeau and Josephine Veasey. They are both fine singers and accomplished great things on their own, but frankly, I probably wouldn't have known of them myself had they not both sung Adalgisa. In the previous post I featured Huguette Tourangeau. This time it's Josephine Veasey's turn. Notice: If you are wearing your adult incontinence brief and ready for a real shocker, scroll down to the end to watch that video excerpt first! We are now inclined to post about two notable mezzo-sopranos who were featured quite often beside Dame Joan Sutherland, Montserrat Caballé,and other great sopranos of the 60s and 70s--Huguette Tourangeau and Josephine Veasey. They are both fine singers and accomplished great things on their own, but frankly, I probably wouldn't have known of them myself had they not both sung Adalgisa. While it is tempting to post numerous videos of Mira, o Norma--and I might do it after all--it might be more informative to post videos of both ladies without those pesky sopranos horning in on the action. Today, boys and girls, we feature the late, great Marjorie Lawrence. Miss Lawrence was cut down from a mighty career by polio, but after a time in retirement returned to the stage to sing roles in operas that were staged around her inability to move around, and also did concerts. I might not have known of Marjorie Lawrence had not my high school chorus teacher studied with her. The story goes that, in her early years teaching, my teacher had taken a gaggle of students with her to a concert Miss Lawrence performed in Charlotte, NC. She took the students backstage to meet the diva, and the students raved about their own teacher. This led to a personal audition with Miss Lawrence and an offer to study with her at Tulane University. Award-winning 10-minute 2011 (?) documentary by 12-y.o. Isabel LeVan. It made me cry. More for historic interest than real charm--which is unusual for the two principals. This is fascinating on so many levels! Marilyn Horne and Leontyne Price, 1982. There are quite a few i spared you. You may thank me at your leisure.